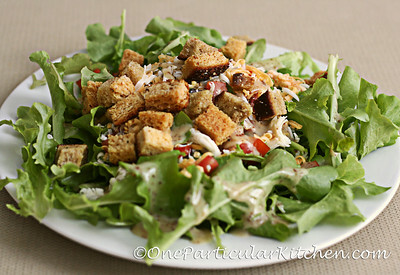 I love this super simple salad! Fresh baby lettuce from the garden, homemade croutons, diced tomato, cheeses, and just a bit of Newman’s honey dijon dressing. SO good! And now that we’ve installed chicken wire around the garden, all the salad is going to me — not the bunnies. So enlighten me! What else should I try while I have lettuce coming out of my ears? I LOVE caramalized onions and toasted puts (pine, pecan, walnut) on my salads. Artichoke hearts are up there as well as olives in moderation. Oh man, I love feta on salad. LOVE it. I also love pecans and walnuts. Homemade croutons, for sure. Dried fruit, too. Ooooh, yum. Goat cheese and blueberries. I love it! You could also do a nice strawberry salad, with feta, snap peas and almonds. when in doubt, I always go with a sliced hard boiled egg, a little bit of cheese, some nuts sprinkled on top. that’s the easiest, assuming you have eggs around 🙂 and if you have any leftover luchmeat turkey or chicken you can add that too. I love anything that uses up what’s in the house — brilliant! And I didn’t think about dried cranberries. Yum! Oh I forgot Pecan Pie Salad! I once googled it, thinking that it didn’t exist, but I was WRONG!!! It’s very tasty. That sounds so good! I can’t believe such a thing exists!